California Governor-elect Gavin Newsom gave his stamp of approval on the work of the 2018 California Economic Summit as it wrapped up today in Santa Rosa. “Please know that my focus on this transition is the best way that I can contribute today to the comprehensive agenda that you have developed over these years – and that you have bolstered during this Summit,” wrote Newsom in a statement to Summit attendees. In order to live the California Dream, the state must reduce income inequality, promote economic security and restore upward mobility. To support this effort, the Summit will institute the CA Dream Index to track upward mobility in the state, the Partnership for Ending Poverty and a regions-up prosperity strategy. To address the disruptions from natural disasters due to climate change and social and economic dislocations, the Summit realized that California must build more sustainable, more resilient communities. CA Fwd assisted the City of Santa Rosa and Sonoma County in creating the “Renewable Enterprise District,” a proposal to seek state support for investment in affordable housing, related infrastructure with long-term local match and regulatory streamlining. Housing supplies continue to fall far below demand continuing a crisis exacerbated by the past and current wildfires and natural disasters. CA Fwd assisted the City of Santa Rosa and Sonoma County in developing a legislative proposal for accelerating housing production for middle and low-income residents in the region. Using the proposal as a model, the Summit will draft a 3.5 million homes framework to ensure that housing is available to Californians of all income levels. A strong economy and upward mobility rely on a strong workforce. To continue to build a skilled workforce, the Summit will work with regional partners to help tailor programs to train low-skilled, low-income Californians so they can attain upward mobility and support the state’s businesses. Millions of Californians are working minimum wage jobs as housing and other costs continue to rise. The Summit recognizes the state’s economy is only as strong as its regions and any statewide strategy needs to be built from the regions up. The Summit has worked with regional partners as well as the University of California Agricultural and Natural Resources Division to accelerate water sustainability and resilience. Water infrastructure is also included in the Elevate Rural CA initiative. Rural California is vital to the economic success of the entire state, even as poverty and unemployment rates in these areas are among the highest in the state. To address these issues, the Summit will focus on three main areas to elevate the state’s rural regions: Forest Resiliency, Water Infrastructure and Rural Broadband Access. California State Controller Betty Yee shared her thoughts on California’s economy noting that while the state has grown into the fifth largest economy in the world, it also has very high poverty rates. The California Economic Summit also recognized the work of two leaders vital to the Summit’s success. The 2018 California Steward Leader Award was presented to Glenda Humiston, vice president of University of California Agriculture and Natural Resources. The Regional Steward of the year was presented to Paul Granillo, president and CEO of the Inland Empire Economic Partnership. "Please do not forget the people for which we do this work," said Granillo to attendees. The California Economic Summit’s Partnerships for Industry and Education (PIE) awards recognized four workforce training programs using public-private partnerships. The first-place entry was Green Energy Training Services Core Apprenticeship Readiness Programs (GETS) in Alameda and Contra Costa counties of the San Francisco Bay Area. Other awardees included the North Bay Construction Corps Program, a partnership between Monterey Peninsula College and Montage Health and the Job Train Health Career Pathways Partnership between Stanford Health Care and Job Train, Inc. The Summit also addressed future initiatives including the early childhood development in partnership with First 5 California, “This is Us” initiative (an inclusion initiative regarding immigrant populations), creating opportunity zones, a strategy for regions-up prosperity and growing and retaining the healthcare workforce. The work of the 2018 Summit will culminate with the release of the 2019 Roadmap to Shared Prosperity, which will guide the Summit as it continues the work throughout the year. 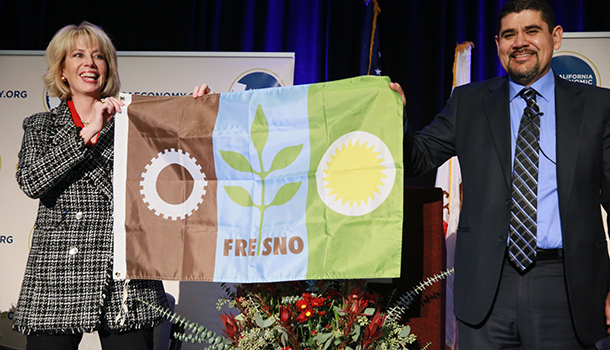 As this year's Summit wrapped up, it was announced that 2019 California Economic Summit would convene next November in Fresno.